A circumpolar species, formerly known south in the Great Lakes region as far as the head of Lake Michigan in Indiana. Lakes, streams, and rivers, especially in marshy borders (but in water as deep as 9 dm), on mucky to gravelly substrates and in cold spring-fed water; in temporary pools and marshes at the edge of the Great Lakes; ditches; the terrestrial form on muddy to sandy or gravelly banks and shores. The Kalamazoo Co. collection was made by the First Survey in 1838; the species has not been found in southern Michigan since. Our only other true aquatic with definitely whorled simple leaves is Elodea, which has 3 (rarely 6) short leaves in a whorl. In Hippuris, submersed leaves are mostly 6–12 (often 9) in a whorl, about 12–25 times as long as wide, and all on unbranched stems. These leaves are very limp and dense (suggesting the generic and common names), but those on emersed tips are firm and shorter than the submerged leaves. 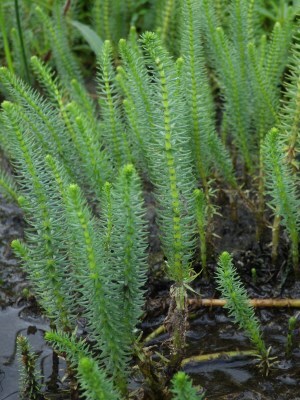 Such more rigid aerial leaves are also found on terrestrial plants on moist shores and banks, where at first glance they may resemble a clubmoss. MICHIGAN FLORA ONLINE. A. A. Reznicek, E. G. Voss, & B. S. Walters. February 2011. University of Michigan. Web. April 21, 2019. https://michiganflora.net/species.aspx?id=1947.